Home > Events > NAS Building > Evidence Development & Use in a Learning Health System: Transforming clinical knowledge generation in the U.S. 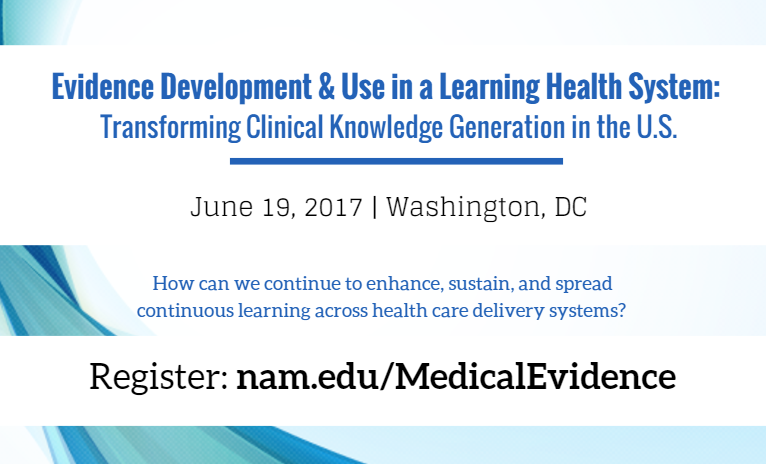 Evidence Development & Use in a Learning Health System: Transforming clinical knowledge generation in the U.S.
On June 19th, 2017 the National Academy of Medicine will celebrate the release of an NAM Special Publication in partnership with the Patient-Centered Outcomes Research Institute (PCORI). This public release summarizes insights from a series of meetings involving health system executives and clinical research leaders exploring the issues, prospects, and progress for transforming evidence development and use. How much can evidence development be accelerated, given current knowledge and resources? What system and culture changes can transform evidence development for the care experience? What are the priorities to move executive leadership to the next level for continuously learning health and health care? This meeting will lead to the identification of strategies to continue to enhance, sustain, and spread continuous learning across health delivery systems. This event is the first public release of the summary from the meeting series. Please register by Monday, June 12, 2017 COB. For questions, please email Marianne Hamilton Lopez at MLopez@nas.edu.